It's the dawn of a new era for the Union Pacific Railroad. 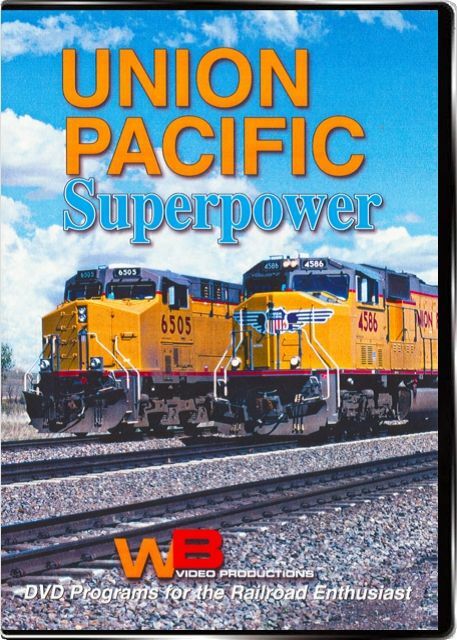 This new railroad needs new Superpower, and General Electric is happy to oblige with the powerful AC60CW, which generates an incredible 6000 horsepower. This new engine joins other super engines such as the 4,380 horsepower GE C44AC, the 4,000 horsepower EMD SD70M, and other powerful engines. The old Wings nose herald has returned and is seen on many units. A variety of power hauls long heavy freights over the Union Pacific's busy Nebraska mainline, across the green countryside and through picturesque tank towns with their towering grain elevators. This fast-paced journey begins at Lodge Pole, Nebraska, and works eastward to North Platte and beyond. Videotaped in May, 2001.
dmacleo (Maine) on 2014-07-14 09:05:30. The content is interesting, the dvd burn itself is a real mess. the title menu is messed up and may not, regardless of country code, play on some players. the issue is the title menu is not automatically appearing so some players will just sit there with a black screen forever. I redid the dvd myself to play on all my players. Leroy (Lethbridge) on 2011-09-24 14:31:59. Pretty good dvd that was transferred from film. Rough on the edges in places, but a good show. I seriously doubt this was shot on "film". It was probably shot on some standard 4:3 video tape format.